"What is Bangkok weather like today" or "When is the best time to visit Bangkok?" I hear you ask. Well weather being weather, there are no certainties but the climate in Bangkok is divided into three distinct seasons; Dry, Hot and Rainy. Just depending upon what you want to do in Bangkok can help you decide the best time to come and make the most of the Bangkok weather. 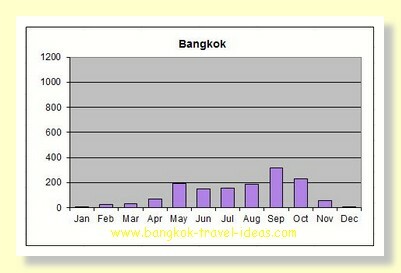 The best time to go to Bangkok is in the Dry Season. Well, the dry season in Bangkok extends from November to February and as the name suggests, there is less rain in this period than other times of the year. There are many fine days with sunshine and also the humidity is lower and the temperatures are not so extreme. Often in December and January there are a couple of weeks of cold Northerly winds blowing from China bringing cooler air over Thailand and down to Bangkok. The temperatures on the coolest days can be in the low to mid twenties and in the evening it can feel quite cool and you may need a light coat or sweater. Even in the day it can feel cold if you have been swimming but you will soon warm up in the sunshine. Overall, the weather in Bangkok during the Dry Season is very pleasant with little or no rain or just the occasional thunderstorm. 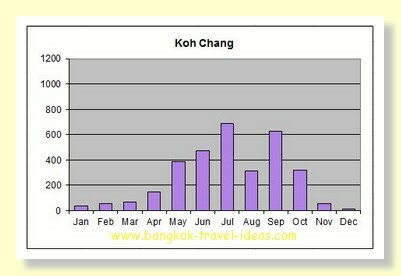 Many tourists escape the Northern Hemisphere winter and come to visit Bangkok during this time and consequently high season rates apply particularly in the post-Christmas period. Hot season in Bangkok is rightly named and this is an apt description with daily temperatures reaching around 40 degrees Celsius. The Songkran water festival takes place at this time, where people engage in throwing water at each other to cool each other down. Because of the heat this is not the most comfortable season for sightseeing and walking around. Generally, at this time Bangkok weather is dry with the occasional thunderstorm but it may be come cloudy and overcast as it gets towards the end of June. The weather in Bangkok during the Rainy Season is surprising not as wet as you might think. The rainy season starts in early July with thunderstorms in the the late afternoon or early evening. These storms can be quite heavy and with gusty winds. As the season progresses the rainfall can increase, but most commonly still as brief periods of heavy rain with the rest of the day being fine or overcast. October is usually the month that some areas of Bangkok experiences flooding. This is a combination of the local rainfall and also flood-waters coming down the Chao Phraya River from up-country. Usually any flooding is isolated to low lying areas and not a problem for the average tourist. Many parts of Bangkok are low lying and sudden downpours of rain can cause flash flooding that significantly affects traffic. Travel around the city by car is best avoided at these time. The BTS Skytrain and MRT continue to run and are the preferred method of traversing the city when this happens. Because of the periodic rain and overcast skies the temperature is not so hot, but the humidity is extremely high and can be very tiring. All things considered, the very best weather in Bangkok is in the Dry Season from November to February. The temperature and lack of rain makes it ideal for walking around the many tourist attractions and also for visiting some of the beaches near Bangkok. The Rainy Season from July to October is also great for visiting the shopping malls as bad weather is limited to short bursts, most frequently in the late afternoon. Now that you know a little about Bangkok weather patterns you might want to read more about Bangkok itself to get a feel for the city before you commit to making your travel arrangements. Just look how variable the weather in Thailand is and how it changes by season. You can scroll down to see the detailed patterns of rain across Thailand and gain a really good understanding about which is the best season to be visiting which area. The left hand scale is the number of millimetres of rainfall measured. 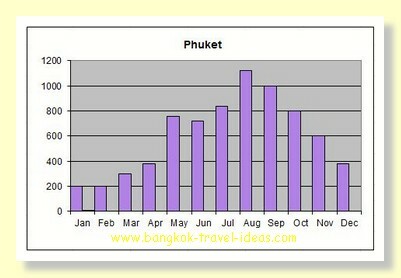 The wettest months in Bangkok are from May to October with September being the wettest. Rayong includes places like Pattaya and Chonburi. It has more rain than Bangkok which is why this Province is home to much of Thailand's fruit farming. One thing to note is that Koh Samet is much drier than this average and is well worth a visit even in the June to September period. Koh Chang is exposed to the South East Monsoon that catches the Philippines and Taiwan each year. However you can see that traditionally August is a good month to visit during the rainy season. 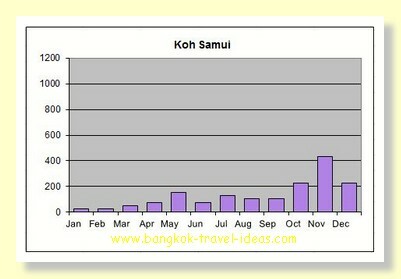 Although Koh Samui is thought to be very wet, the rainfall graph shows that apart from the month of November that is not the case. In fact it only has marginally more rain than Bangkok. Overall the weather in Koh Samui is very good. Well there is no doubt about it, the island of Phuket is the wettest of all. However it is made up of heavy showers interspersed by sunshine with July, August, September and October definitely having more rain than the other months in the year. Chiang Mai has been added because it is a major destination for Bangkok tourists and it also gives some perspective to the other graphs. 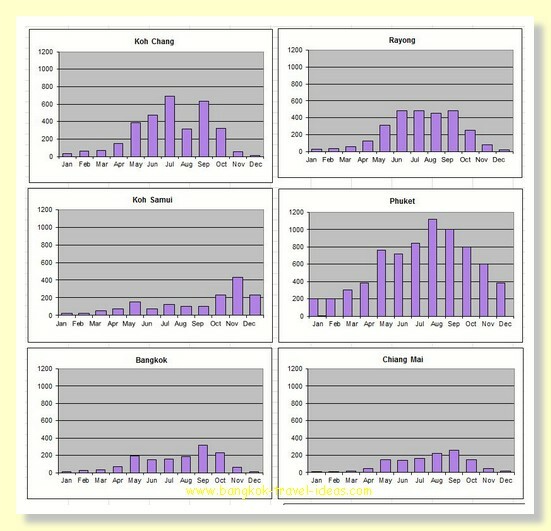 Generally speaking the rainfall is broadly similar to the Bangkok weather.